The New England Patriots have first-world NFL problems with a backup quarterback garnering interest on the trade market. What’s next for Jimmy Garoppolo? Many teams view Garoppolo as the best option of all potential free-agent or trade targets, and the Bears will have competition. Teams like the Browns, Jets and 49ers could provide opposition, but the Bears’ intent and willingness to complete a trade could not be more serious. You would think Garoppolo led the Patriots to the postseason or alternated snaps with Tom Brady during the team’s Super Bowl run to garner this type of trade market attention. Yet, the 25-year-old quarterback beat two teams and went down with a shoulder injury during the previous season. The Arizona Cardinals missed the playoffs. The Miami Dolphins didn’t hit their stride until Week 6 when running back Jay Ajayi exploded for 204 rushing yards. 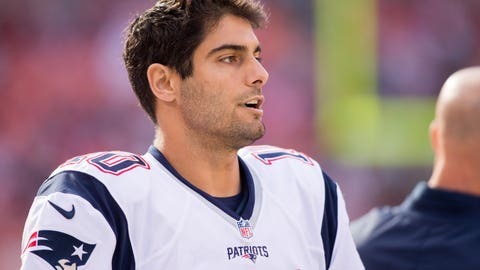 Nonetheless, without prior starting experienced in the pros, Garoppolo looked sharp under center. The Patriots didn’t skip a beat with the backup in command. However, it seems as though teams interested in Brady’s backup are overbidding with multiple draft picks on the line for a passer with two starts. The Cleveland Browns are the only team with enough draft picks to pull off a trade involving early-round selections and still have ammunition to acquire talent at the top of the draft. The Browns have five picks within the top 65. Based on collegiate film study, this year’s draft class doesn’t feature a group filled with potential franchise quarterbacks. The below average class at the position adds to Garoppolo’s allure. With Brady carving up defenses at 39 years old and the drive to play for at least three more seasons, the Patriots should hold on to their 25-year-old backup until next season’s trade deadline. There’s no telling when Brady will begin to decline or the offensive line play falters enough to put the five-time Super Bowl winner’s health in jeopardy. Halfway through the upcoming season, Garoppolo’s trade value should still command at least a first-round draft pick. It’s best to stall a transaction to compensate for an unexpected injury during the season. Furthermore, if the trepidation about Brady starting the 2018 season at 41 years old, the team would promptly prepare Garoppolo for a long-tenured future in New England. The Patriots just came off a Super Bowl, they don’t need ample draft picks. Due to Garoppolo’s solid play in limited action and the Patriots’ winning system, they’re fine with what’s currently on the roster. Next: Belichick, Brady or Quinn, Ryan Going Forward? Every year, a few teams start anew at quarterback or realize they need to begin the search for a new signal-caller. If Brady shows little decline headed toward the 2017 trade deadline, the Patriots could take advantage of a desperate team in need. With another year left on Garoppolo’s contract and Brady one injury away from sitting out, why rush a trade deal? Keep the heir to Brady’s throne and unload him for a return at the latest possible time.